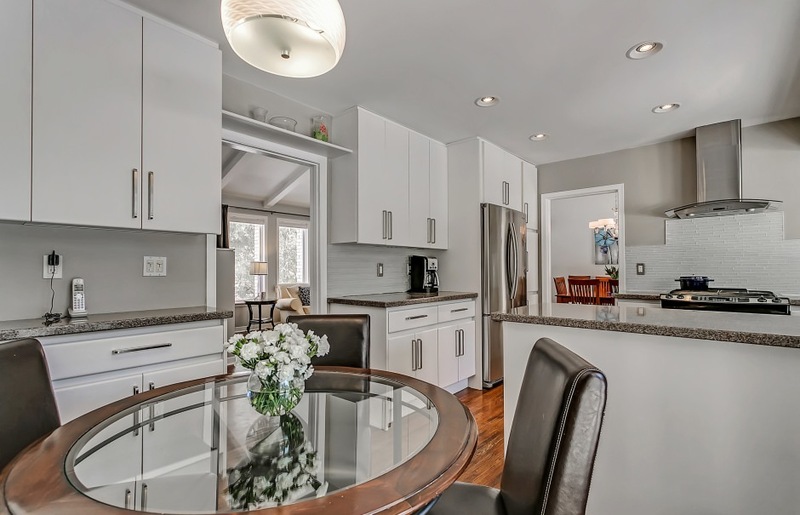 Upgraded family home in South East Oakville. 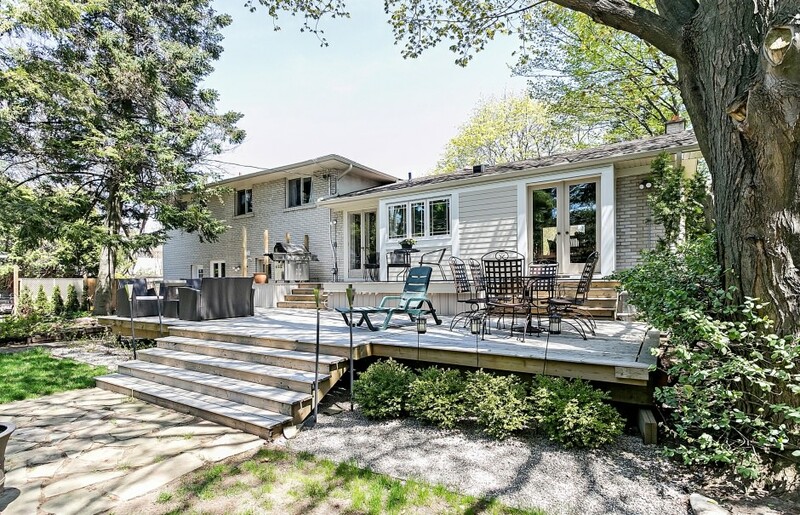 This renovated side-split offers almost 3,000 sq ft of living space over four levels, and is situated on a private 102’ x 153’ lot. A light-filled foyer with travertine marble flooring opens to the open concept living and dining rooms with oak hardwood flooring. Expansive windows and a vaulted ceiling with painted beams give the space an airy feel. A gas fireplace is the focal point of the room, with elegant double wall sconces matching the dining room’s central chandelier. The dining room features a double French door walkout to the rear yard and two-tiered deck, as well as convenient access to the eat-in kitchen with quartz countertops, modern glass subway tile backsplash, and stainless steel appliances. The master bedroom, with oversized built-in closets, opens through a pocket door to a gorgeous five-piece Art-Deco ensuite with heated marble tile flooring, His & Hers Mirabelle pedestal sinks, walk-in glass shower, and a separate soaker tub with jets and extendable California faucet. 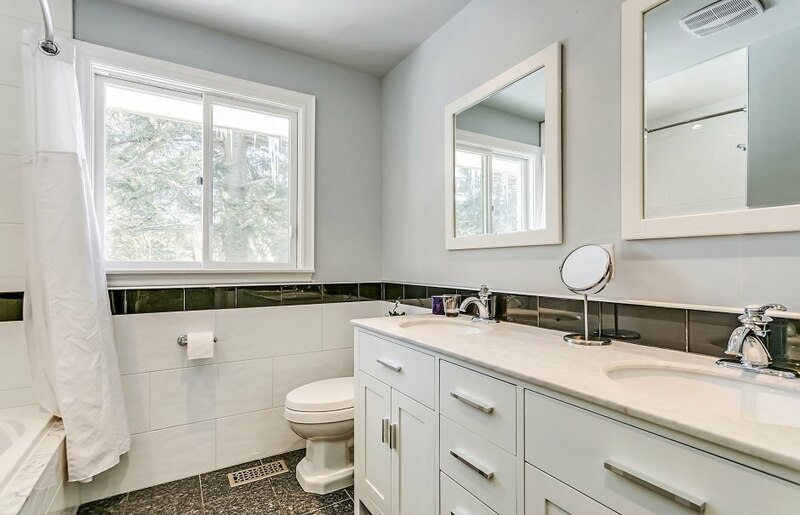 The main five-piece bathroom, with honed granite tile flooring and a built-in double vanity with marble counter top, services three additional bedrooms. Above grade windows allow for plenty of natural light in the lower level recreation and exercise rooms, with engineered hardwood flooring, dimmable LED pot lighting, surround sound speakers, and a gas fireplace with full-height stone surround. Back at entry-level, a good-sized den opens through double French doors. A charming powder room, laundry room, and double garage complete the home. The private rear yard is fully fenced, with mature landscaping. A custom two-tiered deck with gas BBQ hook-up, and additional stone patio, provide ample room for entertaining and enjoying the outdoors. Solid family home in a great school district, just a short walk to charming downtown Oakville and quick access to the GO and major commuter highways.